There are Lots of Retirement Communities in the Ocala, FL, Area. Why Live at Lake Griffin Harbor? If you are looking at retirement communities in the Ocala, FL, area, there are many great reasons to become a resident of Lake Griffin Harbor – one of five retirement developments in the state owned by Blair Group. First, Lake Griffin Harbor has an exceptional lakeside location. Our 55+ community is located at the southern tip of Lake Griffin, a 9,400-acre lake that is a thriving bass fishery and a boater’s paradise. Many retirees choose LGH over other retirement communities specifically because of how easy our community makes it to spend time on or near the water. Second, there are many resort-style amenities onsite that are for the exclusive enjoyment of our residents and their guests. For example, there is a private 55-slip marina, private boat ramp, outdoor pool that is heated and screened, fitness center, library, and spacious banquet hall with a performing arts stage and dance floor. 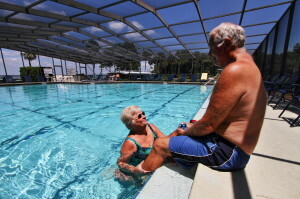 Not many retirement communities near Ocala have such excellent amenities. Third, Lake Griffin Harbor isn’t merely just a place to live … it’s a lifestyle. We are an age-restricted community that is designed to allow you to get the most out of your retirement savings in the company of friendly neighbors of similar age. With reasonably priced housing, great amenities, and professional on-site management, we make it easy for our residents to lead an affordable Florida lifestyle. For more information, contact one of the Lifestyle Consultants at Lake Griffin Harbor, arguably one of the best retirement communities in the Ocala, FL, area.